Apple is rumored to be working on a gaming controller for the iPad. During their new iPad review, Anand Lal Shimpi from Anandtech said he was aware of an internal project to create a physical controller but was unsure if it would ever see the light of day. Tablet makers have demonstrated that you don’t need a physical controller for games to be interactive and fun. Most titles in the App Store use a simple one or two finger interface to control the action on screen but a growing number of games are becoming more complex and require more in-depth controls. Console and PC titles like Grand Theft Auto are being ported to tablets and while the touch interface does work, it’s apps like this that could certain benefit from a physical controller with dedicated buttons. But does it really make sense for Apple to release such a product? Well, that depends on who you ask. 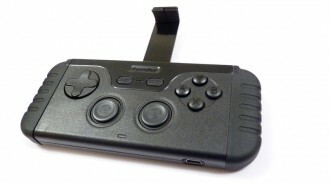 Android users have been enjoying USB gamepad support for some time now. Heck, there’s even an app called DroidMote that allows gamers to use their Sony Ericsson Xperia Play phone as a controller for an Android tablet. iOS option are a bit more limited but do exist via Bluetooth. iControlPad is a universal control pad that works with a number of devices including several Apple models. Gametel showcased their portable controller for Android and iOS at CES 2012 and there are a couple of notable iPad products like the iCade and Fling analog joystick. Do you think Apple will release a gamepad for the iPad / iPhone and if so, is it something you’d be interested in?